Growing up, I loved reading short stories in a whole bunch of magazines. Some were publications that came and went - others endured and became touchstones in the sci-fi and fantasy world. Interzone was one of the magazines that most connected with me - and it's Interzone that Uncanny most reminds me of. It bristles with style, verve and attitude, not shying away from cocking a snoot at the powers that be, while embracing a modicum of silliness too with its love of Space Unicorns. But then, frankly, who couldn't love a Space Unicorn? This latest issue features some smashing short tales - and some challenging essays too. Both LGBTQ issues and liberal resistance to the election of the latest US president feature strongly here, but eloquently expressed and argued. Of the stories, I loved Sun, Moon, Dust, by Ursula Vernon, in which a farmer is bequeathed a legendary sword filled with spirits ready to offer their powers to help him conquer the world - only he's got some potatoes to harvest and isn't really aiming to conquer anyone. It's at first light-hearted and comic, and then touching as the story, like the farmer's plants, digs its roots in. I also loved Small Changes Over Long Periods of Time, by KM Sparza - though it's a challenging read. It tells the tale of a transgender individual bitten by a vampire, and the consequences - and changes - that brings. It's a bubbling mass of blood and desire, despair and anger, and there are issues of non-consent that aren't quite confronted head-on in the text. 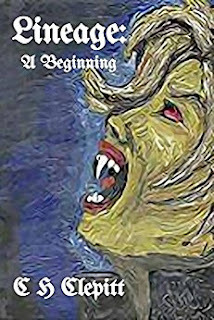 It's messy - not in the sense of the story construction - but in the way in which the vampire's victim grapples with her life, looming death and potential unlife. It's the kind of read that makes you think about the issues within - and that makes it a top-notch story in my mind. There are other stories which aren't quite as successful - John Chu's Making The Magic Lightning Strikes Me features a bodybuilder who alters his form through surgery and drugs to fit his illicit job of moving people from country to country with no questions asked. Elsewhere, the story dwells on the main character's love of theatre - and on the complex, fractured relationship with the friend who shows concern for his well-being, and perhaps love. For me, the different elements in this story just didn't quite come together - so while there was much that was compelling, the story didn't quite click into place. The issue is rounded out by essays looking at gender issues in Deep Space Nine, how to get involved in politics, poems, interviews and more. 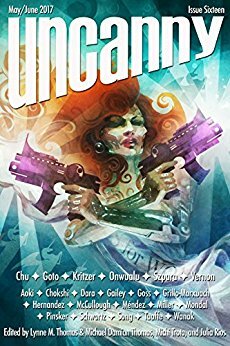 If you haven't checked out Uncanny, it's well worth doing so - not as hard to track down as a Space Unicorn, and just as fabulous. CH Clepitt has a knack of making you want to read more. Lineage - subtitled A Beginning - does just that. This is a tale of vampires and vagrants, in which a down-on-her-luck girl who makes bad choices in boyfriends ends up caught between gang bosses and something a whole lot more dangerous - and the key to her survival lies in, fittingly enough, her blood. It's only a short story - probably about 5,000 words or so - but great for a quick read for the bus or train. 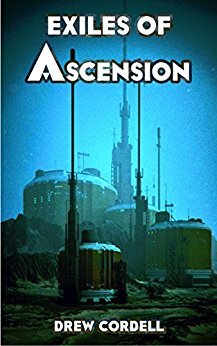 There's no messing around in this novella from Drew Cordell - the action comes at you right from the start faster than the deadly missile that's launched at the crew of the International Space Station who form the cast of the piece. Now, first off, you should know this is a prequel novella that serves as a lead-in to Cordell's novel series, so if you're expecting everything to be neatly wrapped up by the time you read The End, then this isn't the place to look. Rather, this serves to introduce the world of the series, highlight its dangers and keep your pulse pounding. There are explosions aplenty, some bad choices that leave characters facing the most perilous of consequences, and questions that linger after the finish of the book. I wish it perhaps had answered one or two of those questions within these pages - but heck, leaving me wanting more is exactly what a prequel novella should do. I should get on with reading the follow-up!